From the first appointment to patient discharge from hospital, ECS Anesthesia is your solution for anesthesia before, during and after the operation, in accordance with official standards and recommendations. A system dedicated and designed to critical care services that integrate into the facility HIS. Fine-tuning based on the daily tasks of ICU teams. ECS IMAGING allows all of the images generated in a healthcare facility to be stored, shared and viewed. The modular, evolving architecture of the solution is suitable for a wide range of facilities. 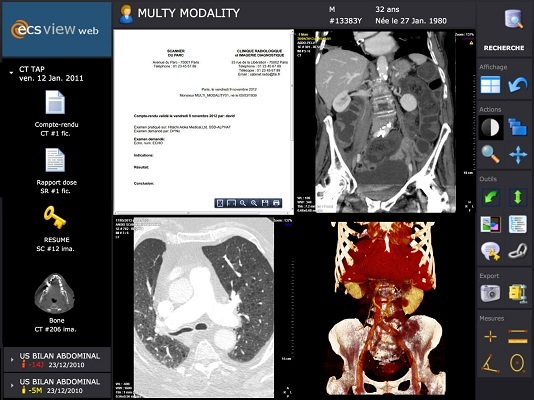 ECS Workflow is a web Radiology Information System (RIS) for single or multiple sites. ECS Workflow is designed for all types of healthcare facilities - hospitals, clinics, imaging centres and radiology clinics. ECS Op Room is a modular system designed with and for surgical teams, in collaboration with several university hospitals and hospital centers. The ECS View diagnostic console is the ideal solution for interpreting your examinations, and communicating your results in your healthcare facility or remotely as part of a teleradiology project. ECS Transfer enables the secure transmission of images produced in a healthcare facility and the receipt of these on remote sites via the Internet. ECS Sharing enables the distribution and visualization of all of the medical images produced in a healthcare facility. Remote interpretation, examination requests, work list, digital dictation and voice recognition - all of these functionalities are combined in a unique web interface.